Can you believe that it is already November? I can’t, Christmas is right around the corner. This means that we have an amazing opportunity to share God’s love around this world. This year we have decided to support Operation Christmas Child. This is a program that allows us to give a shoebox of presents to a child on the other side of the world. It also opens up a door for the Gospel to be preached. Each shoe box costs $7 dollars to ship. Then the box must be filled with the items. It costs all around about $15-20 total per box. Of course it varies depending on the items included. We have decided to donate at least 10 shoeboxes. I believe that this will extremely bless many kids who do not have anything for Christmas. It is also a way to spread this grace message! Will you partner with us? If you feel led to help with this cause, simply give a donation of any amount to the ministry and attached a note that this is for Operation Christmas Child. 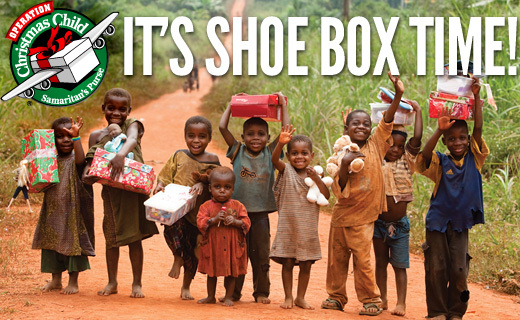 100% percent of the proceeds will be given to these shoeboxes! Click the link below to donate! The deadline is November 20th, so we have to pack these soon. Thank you for reading this! If you have any questions, make a comment below! “And He said to them, ‘Go into all the world and preach the gospel to all creation'”. (John 16:5) (NASB).